Yanworth was having his first start since finishing second in the Neptune Investment Management Novices' Hurdle at the Cheltenham Festival, a performance that was deemed disappointing such was his reputation. Not everyone will have been swayed by his narrow defeat of a gallant Lil Rockerfeller who was conceding 4lbs to the winner but it was a more than satisfactory return on testing ground. A little keen early, it took time for him to settle under Barry Geraghty who anchored him towards the rear of the five strong field. They were closely grouped turning into the straight for the last time as Trevor Whelan kicked for home about Lil Rockerfeller. Yanworth loomed up alongside as the remainder failed to pick up but he just couldn't get past Neil King's five-year-old. Lil Rockerfeller jumped the last in front but Yanworth gradually wore him down to win by three parts of a length. Geraghty said: "I was never sure I was going to get past until I flew the last and he battled well from there. "He is very comfortable at that trip, but I just feel he would be more comfortable at a staying trip. He needs to improve a lot for it on form to be with the best." King said: "It is a huge relief. He has not been on the grass and one or two of our proper jump horses in the last week or two have just been found out. "He has done a lot of work but there is a fair bit of improvement to come. 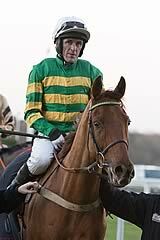 Just talking to AP (McCoy) and Barry he might well go up (in trip) and we could look at the Long Walk Hurdle. "That was five minutes of hell. I thought he was held between the last two, but he has dug in. "He has not had much practice, as in his first four races over hurdles he had not come off the bridle. Physically he will come on for that." Neil King said of the runner-up: "I came here saying if I finish second to Yanworth I would be very happy and that's what he has done. Trevor Whelan has ridden a smashing race. He will come back for the Long Walk." Sky Bet left the winner at 10/1 for the World Hurdle at the Cheltenham Festival and pushed him out to 16/1 from 12/1 for the Champion Hurdle.